The BH-20 compact PPV fan allows you to respond faster, and starts instantly on battery power. It is ultra-portable and ergonomically designed to be carried by one person while running. Two BH-20's will fit in the compartment space normally required for one comparable PPV. The unit will run for 20 to 80 minutes on the LI-ION battery, or unlimited from an AC outlet. RAMFAN EX400 ELECTRIC PPV - 16"
The RAMFAN® EX400 Electric Powered 16" PPV with PowerStream® Technology offers superior ventilation. IntelliSense™ water-resistant variable speed controls deliver continuous airflow adjustment from zero to maximum speed. RAMFAN EX500 ELECTRIC PPV - 18"
The RAMFAN® EX500 Electric Powered 18" PPV with PowerStream® Technology offers superior ventilation. IntelliSense™ water-resistant variable speed controls deliver continuous airflow adjustment from zero to maximum speed. RAMFAN GX200 GAS PPV - 16"
The RAMFAN® GX200 Gas Powered 16" PPV provides the ultimate in portability and is designed to be carried up stairwells in large commercial buildings or set up for PPV in residential locations. The RAMFAN® GX200L Gas Powered 16" PPV is the lightest on the market, and provides the ultimate in portability and is designed to be carried up stairwells in large commercial buildings or set up for PPV in residential locations. RAMFAN GX350 GAS PPV - 18"
The RAMFAN® GX350 Gas Powered 18" PPV with PowerStream® Technology offers superior ventilation with less equipment clutter and reduced noise. PowerStream air straighteners produce a powerful, focused beam of air allowing the GX350 to be set back up to 18 feet from a structure’s entrance. RAMFAN GX400 GAS PPV - 21"
The RAMFAN® GX400 Gas Powered 21" PPV with PowerStream® Technology offers superior ventilation. PowerStream® air straighteners produce a powerful, focused beam of air creating 16,797 cfm (28,555 m3/hr) for a single door, and 22,500 cfm (38,250 m3hr) for a double door operation. RAMFAN XP500 ELECTRIC PPV - 18"
The RAMFAN® XP500 Electric Powered 18" PPV with PowerStream® Technology, is equipped with an ATEX certified motor for safe use in dangerous atmospheres. IntelliSense™ water-resistant variable speed controls deliver continuous airflow adjustment from zero to maximum speed. The 718-B is an 18″, variable speed, electric and battery powered PPV set on the classic 7-Series frame . A perfect combination of size and power, a variable speed PPV that offers precise control of air movement and up to 33% more airflow than single speed motors. The 718-B will run on any 15 amp GFCI circuit or the supplied lithium-ion battery for extra versatility. The V18-EV is an 18″, variable speed, electric PPV set on the innovative Valor frame. A variable speed PPV that offers precise control of air movement and up to 33% more airflow than single speed motors. The V18-EV will run on any 15 amp GFCI circuit and new hydraulic generators. The 718G4-H is an 18″, gas powered PPV set on the classic 7-Series frame. A perfect combination of size and power for departments looking for an every day PPV fan in need of a quick set-up and not dependent on generators or electricity. The SV3-20 is a high power, reliable chain saw made for venting and rescue operations. Proven ability to cut layered residential roofing, downed trees and building materials. 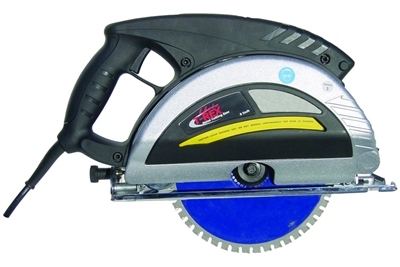 UNIFIRE CIRCULAR RESCUE SAW - 14"
The PRO-SAW/CUT-OFF Saw can cut virtually any material - brick, concrete, wood, steel, etc. The perfect fire service saw. Ergonomically designed to work in confined spaces. Light weight and powerful for safe and easy operation. Built tough to meet your extreme demands. Unifire DS-Series fans feature stainless-steel full-wrap frames that protect the fan from virtually any angle. The fans are stand-alone operational, allowing one more rescue personnel to assist with the rescue needs than simply watching the fan. With the open-shroud and specially angled fan blades, Unifire fans are able to be placed closer to the opening than closed-shroud fans greatly decreasing cross-wind variables, that diminish the usefulness of a PPV fan. The open-shroud design allows for up to 20% more air flow than a closed shroud fan. Unifire DST-Series fans feature stainless-steel full-wrap frames, large wheels and tires that react to vibration like a pneumatic tire but are solid rubber. The fans are stand-alone operational, allowing one more rescue personnel to assist with the rescue needs than simply watching the fan. The open shroud allows the fan to be placed closer to the entrance, greatly diminishing the effects of crosswinds. The open-shroud design allows for up to 20% more air flow than a closed shroud fan. The Unifire Electric PPV Fans feature high performance electric motors that deliver high RPM directly to the fan prop and allow the electric PPV fans to create as much air movement as gas powered fans. Unifire electric PPV fans are able to be equipped with the DS, DST, or DU-All frame styles. The DU-ALL frame style allows the fan to be positioned in any 360 degree position. UNIFIRE T-REX METAL CUTTING SAW - 9"
Faster, safer, cleaner and more affordable than other metal cutting equipment. T-REX saws deliver unmatched results, cutting steel as easily as cutting plywood. A uniquely designed cover collects virtually all chips and sparks, while a special spindle lock allows for fast and easy blade changes. Create up to 3.25" depth of cut with the 9" T-REX metal cutting saw. Whatever your cutting demands may be, achieve them with the T-REX metal cutter...High Quality power tool with amazing capabilities! UNIFIRE VENTILATION RESCUE CHAINSAW - 16"
Univent saws are built from the ground up to withstand the most extreme conditions. They feature an air injected engine, pure-foam air cleaner, high-performance carburetor, stainless-steel muffler-guard plate, solid bar with replaceable tip, and Carbide Chain of America chains. The chains and bar have been specially designed for a more secure connection to significantly diminish side-to-side chain motion and standard anti-kickback features to create a much safer cutting tool.